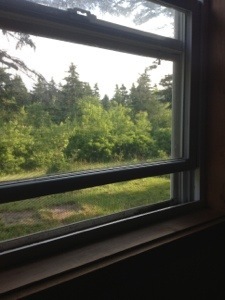 I’m hanging out at a cottage of my friend, listening to the early morning birdcall that drowns out the sound of ocean surf. It’s green and lush here, filled with happy sounds of squirrels running overhead, sweet flollipy bunnies galumphing in the yard, tiny birds chipping and chirping while crows caw overhead. And behind, the breathing ocean, in out, in out, with the occasional sigh of a large wave crashing. It’s soothing and grounding, this close contact with nature, the touch of sand on your feet, the whisper of water over your toes. The water here in PEI is unnaturally warm. Last night when I dipped my toes in, they didn’t shriek with pain as they normally do. It seemed odd, combined with my childhood memories of a time where people swimming would turn a pale shade of blue. Pointed out that the world is indeed changing. But still the birds sing, the grass grows, twitterpated squirrels chase one another through the trees. You can’t help but think, somehow, it’s all right in the world here…on this “gentle island”. Get lots of writing done!!!! And have fun! I can almost hear the ocean. Sounds great, DA.